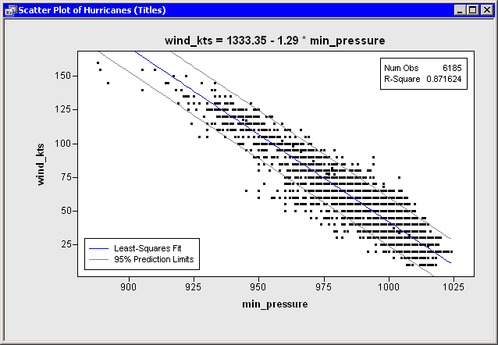 This section adds an inset to the graph that shows the number of observations used in the regression and the R-square value of the fitted model. You can add an inset by using the DrawInset module that is distributed with SAS/IML Studio. The module is documented in the SAS/IML Studio online Help. The following statements show one choice for creating an inset. Add the following statements at the bottom of the program window, and select Program →Run from the main menu.